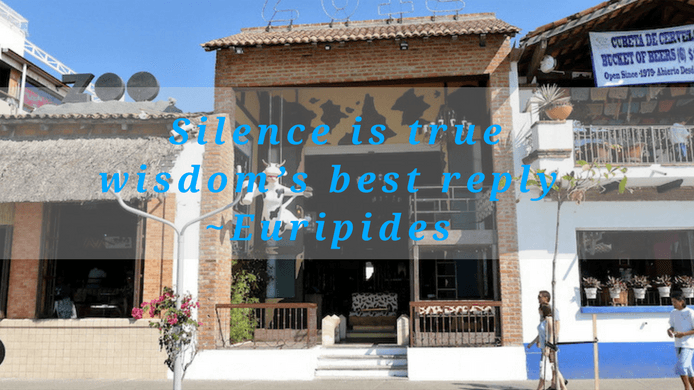 / 30 Silence Quotes by Famous People of our History – Is Silence Golden? There is a song titled “Silence is golden”. This song probably was inspired by the ancient proverb “Speech is silver and silence is gold”. Is silence really golden? Well, it depends. Sometimes silence is better than words. Other times words are needed. 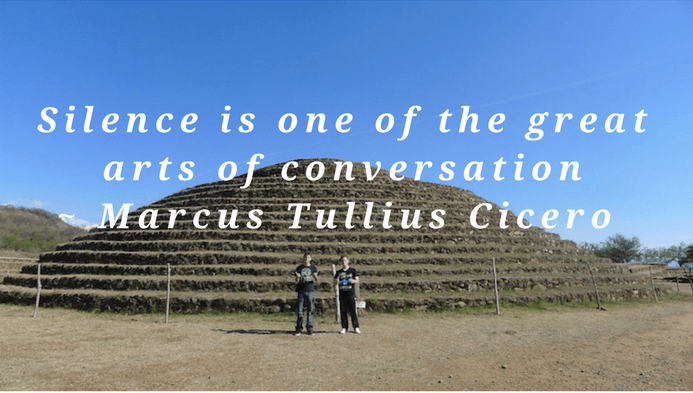 Through these silence quotes, discover what some of the famous and influential people of our history wrote about silence. Then feel which silence quotes resonate with you. 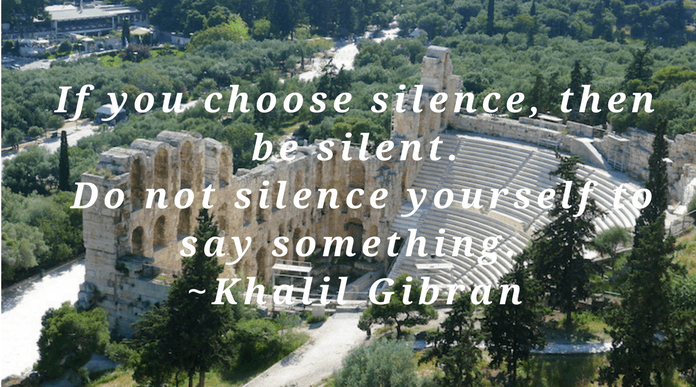 What are your beliefs about silence? 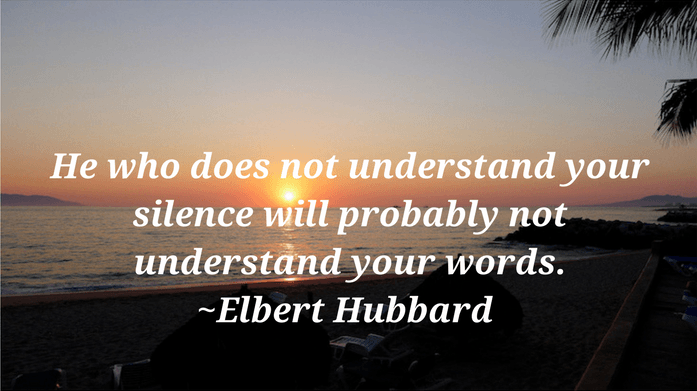 Elbert Hubbard in this silence quote is saying that if someone is reactive, then he/she is prone to misunderstand both your silence and your words. Reactiveness, in this context, refers not only to the obviously reactive people. It also includes subtle reactiveness. Do you tend to take personally others silence or words? Do you then feel hurt or feel some contraction in your body? With the exception of the few ones who have reached high level of consciousness, we all react sometimes to others silence or words. Some of us react with more intensity and frequency than others. The degree and frequency of our reactiveness and pain is directly correlated with unhealed wounds. The words and silence of others can act as triggers or irritants of our unhealed wounds from past events. If you have unhealed wounds or there are misunderstood topics in your relationships. Then you would greatly benefit from a course by my teacher Julius called: Healing the Unhealable. Rumi in this silence or absence of words quote is implying that there is information that we can listen to – that is beyond words. 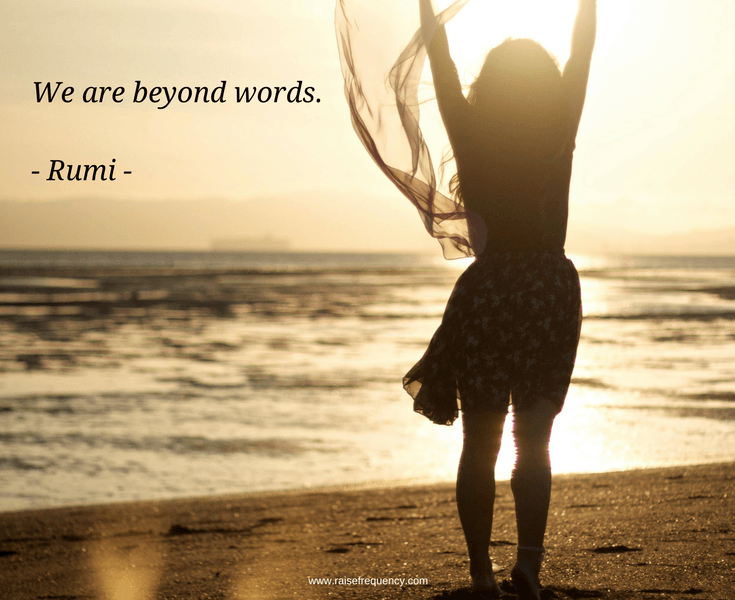 In this quote, Rumi is expressing that our true self is beyond words. The reason is that: Our true self is silence, is eternal, is infinite and there are no words that can express the magnificence of our souls. The complexities and multidimensionality of our souls is so vast and fascinating that are beyond words. However until we learn to get information telepathically through frequencies, we do our best with words. Some channelers have the ability to translate into words the messages transmitted through frequencies by high consciousness intelligence beings or councils. Kasey and Brad channel the high consciousness teachings of Julius. They are offering a fascinating course called: What Does It Mean To Be Multidimensional? I am a fan of Julius and I am grateful that Kasey and Brad are sharing such amazingly life changing and expansive information. If you like to expand your mind and learn about the magnificent, complex and multidimensional being that you are, check out this mind-blowing course at: What Does It Mean To Be Multidimensional? 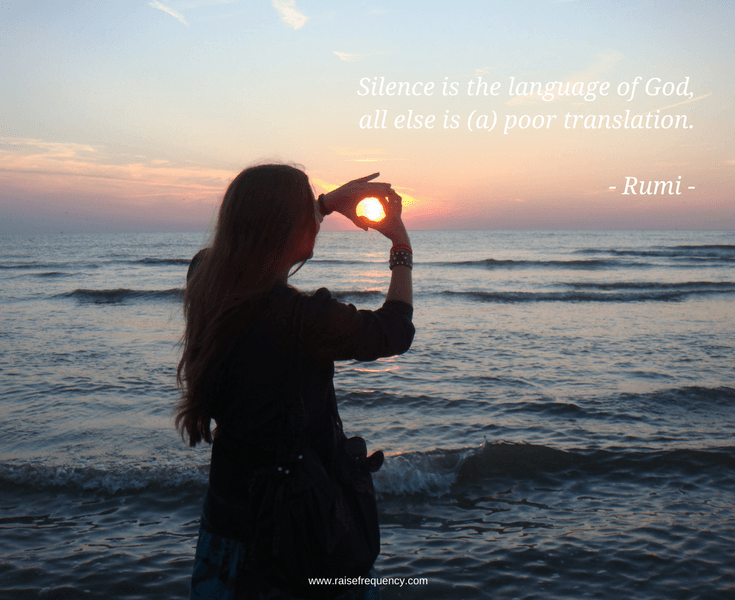 In this silence quote, Rumi is expressing that words are poor translation of the language of God and the Universe. The language of God and the Universe are frequencies. This is a fundamental principle of Law of Attraction. This language quote encapsulates a key understanding of the process of manifestation of our desires. In other words, it is not enough to express in words our desires. To manifest our desires, we need to generate and send out through our auras the frequencies of our desires. Nowadays we are so used to words that we forgot the art of communication in silent ways. There was a time when we knew how to feel each other and communicate telepathically. 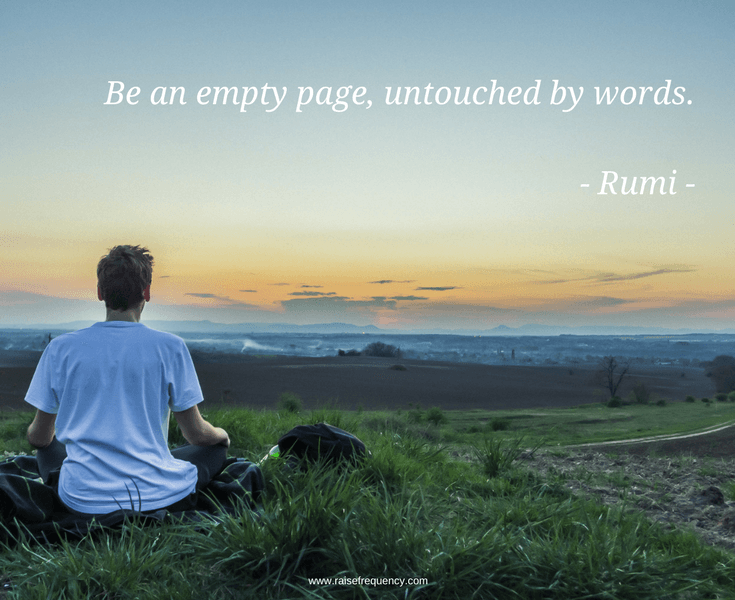 Rumi, in this absence of words quote is expressing that communication void of words is more efficient. You can practice communication without words with your partner by pausing and feeling into each other. After few minutes in silence, share with each other what you feel. In addition, you can make it a practice to spend some time looking into each other eyes - in silence. This practice is an intimacy booster in love relationships. In this silence quote, Rumi is saying that the heart knows thousand ways to speak without words. Speaking without words is speaking in silence. The language of the heart is composed by numerous emotions. 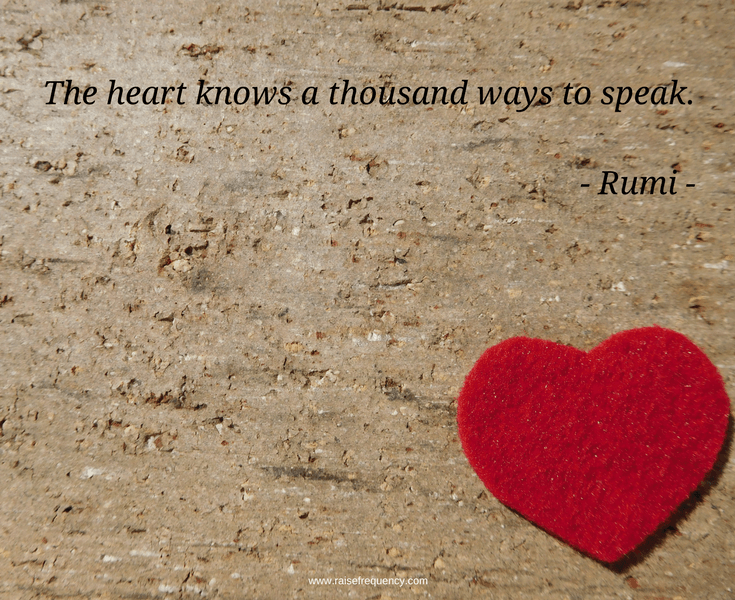 In other words, the heart knows many thousands emotions or ways to speak in silence, as Rumi said in this quote. Interestingly, each emotion has a frequency that runs through our bodies out into our aura or electromagnetic field. Therefore, since our auras intermingle with each other, we can feel each other emotions. Being an empty page means being untouched by the words of the stories of the past. It means living in the moment of Now. Untouched by words also means being in the vastness of silence that contains the potential of everything. 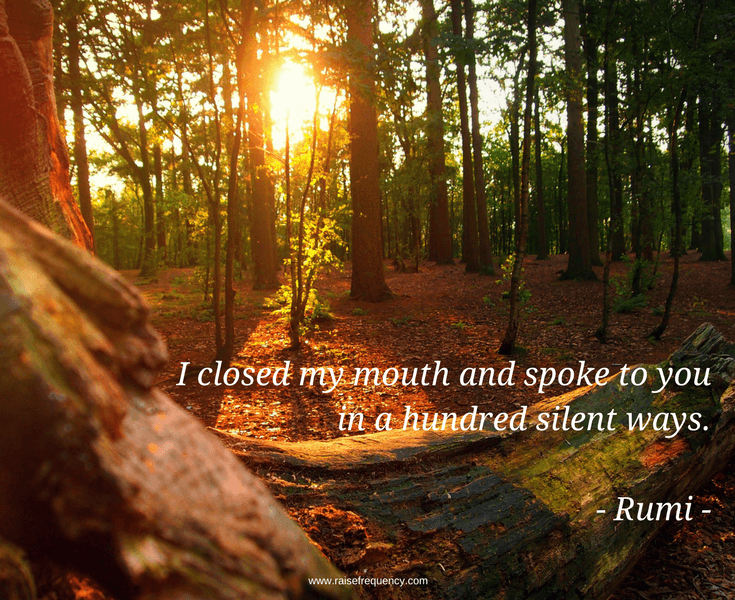 Rumi in this silence quote is referring to your inner voice. 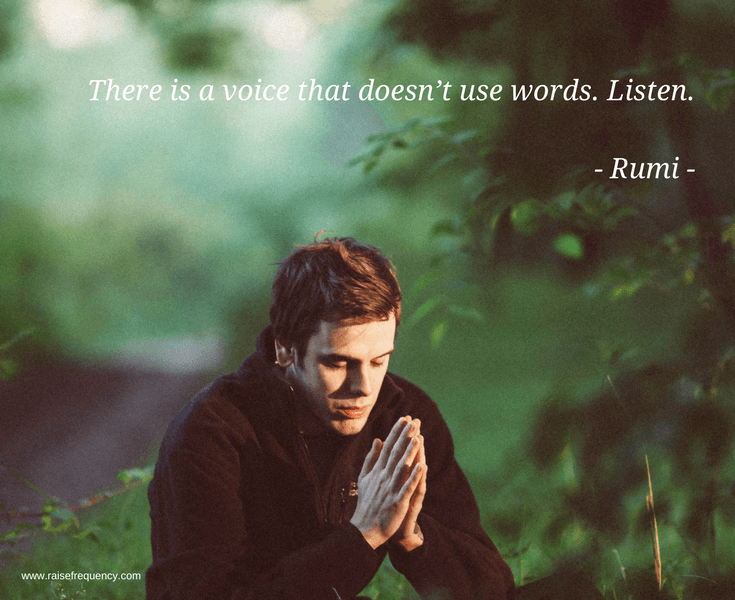 Rumi is taking about the voice of your heart. Listen to this silent voice because in the silent wisdom of you heart, you can find all your answers. Ask your heart deep questions and listen. Listening to your heart is an act of self-love and self-awareness. 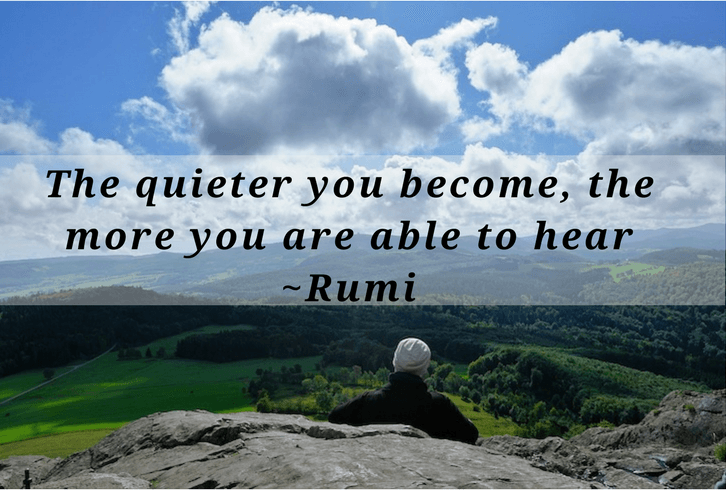 Rumi in this quote is saying that - the more you are able to quiet the voices in your head and feel calm, the more able you will be to hear the silent voice of your heart. 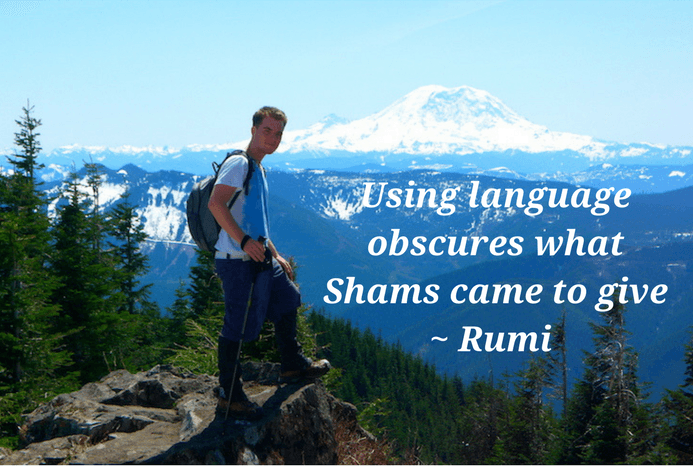 Rumi in this quote about words and language is pointing out that words have limitations and can be deceiving. On the other hand, the silence of emotions and feelings are unequivocal. Words can be defined or interpreted in different ways by different people. With the aid of dictionaries we try to get to common understandings of words. However, even with dictionaries and immediate answers through google, - there can be multiple interpretations of a phrase or group of phrases. In addition, a person can say words that do not match with his feelings or truth. Therefore words can be deceiving. 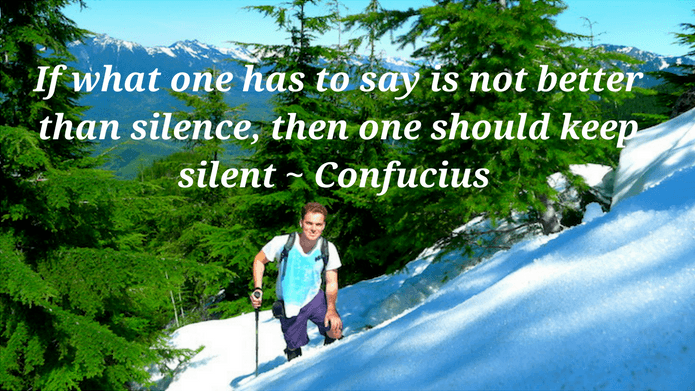 The meaning of this silence quote by Confucius is related to the fact that the language of silence is unequivocal. In opposition to silence, communication through words can be misleading or deceiving even unintentionally. When words are used to intentionally mislead or deceive others – that is betrayal. 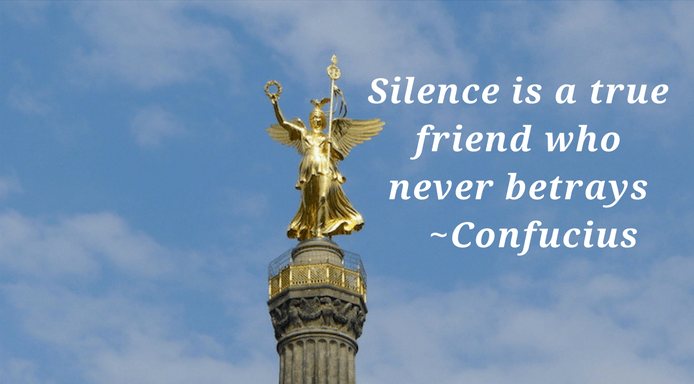 Confucius in this silence quote is telling us that keeping silence is better than engaging in an empty conversation. In other words, allow yourself to be comfortable with silence. Enjoy being in silence by yourself or with someone else. 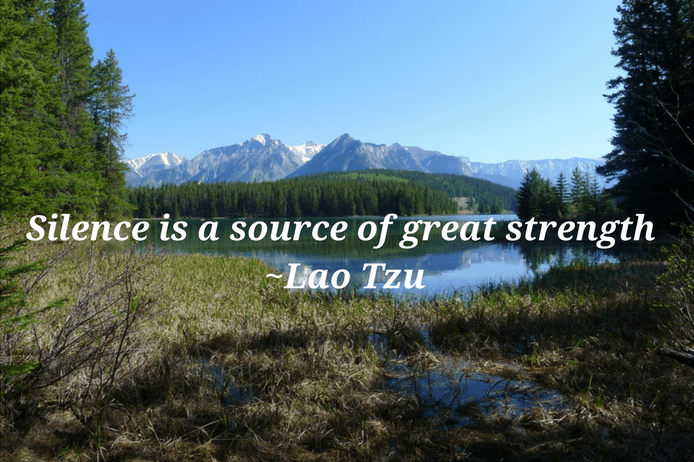 Why silence is a source of great strength? 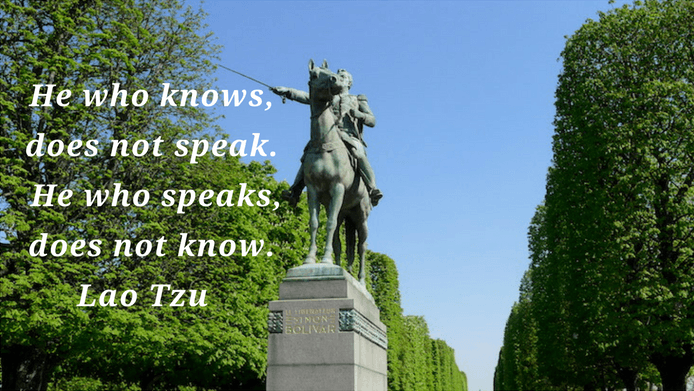 What is the meaning of this Lao Tzu silence quote? When we allow ourselves to be in silence, away from external distractions, we can connect with our souls and our authentic self. When we connect with our authentic self, we find great strength. We remember our true nature of divine love and power. When someone is knowledgeable and confident does not feel the need to speak to get acknowledgment and recognition. In contrast, someone who lacks confidence on his knowledge feels the need to speak to get validation and recognition. How many times we engage in shallow conversations because we feel uncomfortable with silence? 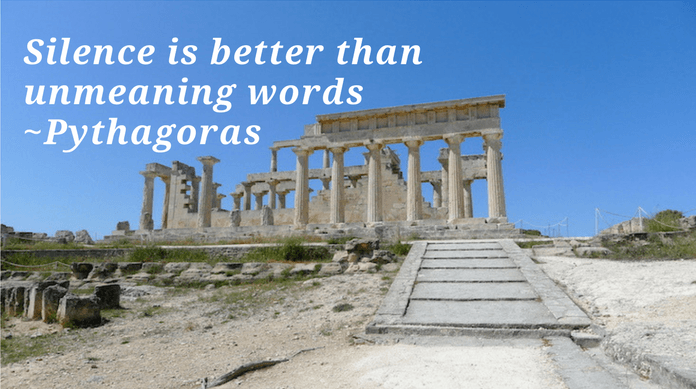 Pythagoras, in this silence quote, is remind us that silence can be better than words. 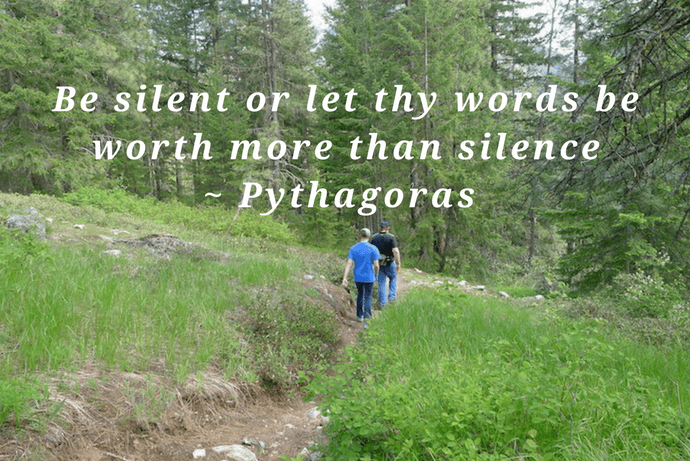 Pythagoras in this silence quote is advocating the use of words for deep and meaningful conversations. Leverage deep questions to stimulate meaningful conversations. What is the meaning of this silence quote? 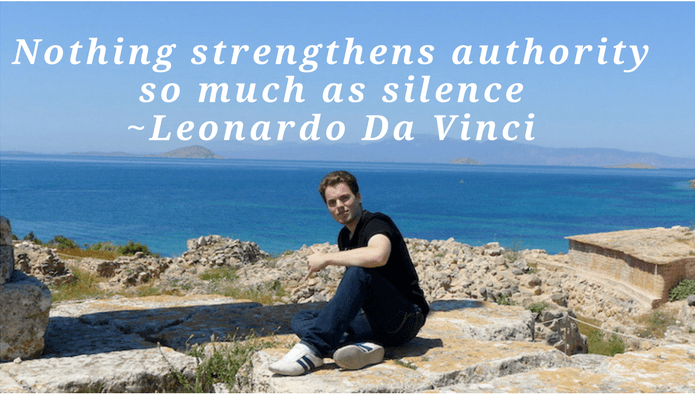 What does Leonardo Da Vinci mean with “silence strengthens authority”? People who are aligned with their own authentic self have self-confidence and self-esteem. Therefore they do not feel the need to use words to defend their views and perspectives. They stand strong in the authority of their true inner self without the need to use words to seek external validation. The more they are able, in silence, allow others their own perspectives or truth, the more their own inner authority is strengthened. How many times do we get into long arguments and even conflict – just for the need to be right? The need to be right is a sign of lack of self confidence and low self esteem. The reason is that we are depending on others people validating us. 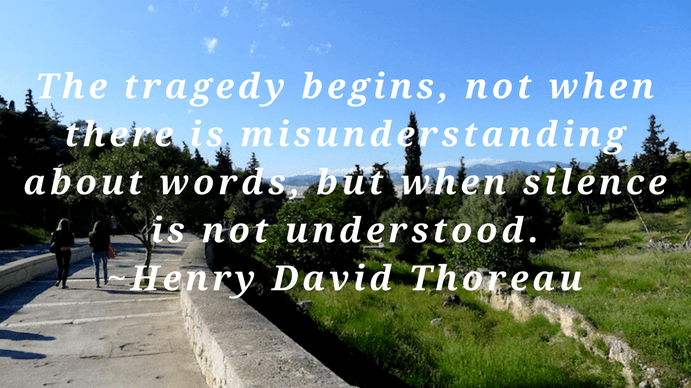 This silence quote is about having the wisdom of not reacting to hurtful words. It is about having the understanding that when others are judging us, they are judging themselves. This silence quote is about knowing when to respond with words and when to respond with silence. “When you find the person you love, an act of ancient recognition brings you together. It is as if millions of years before the silence of nature broke, your lover’s clay and your clay lay side by side. 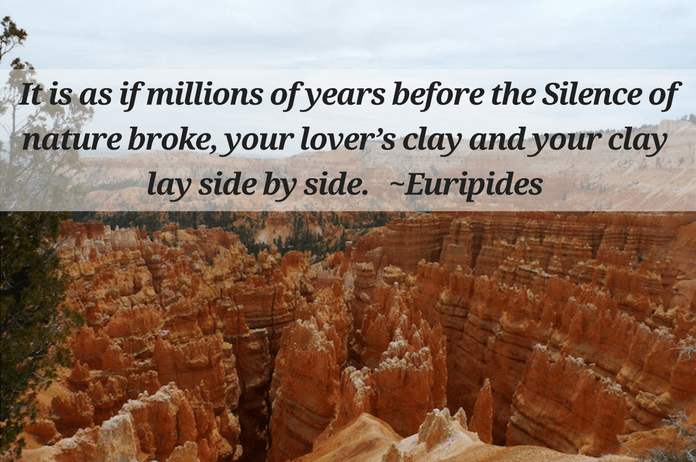 Euripides is taking about soulmates that have known each other before the beginning of time. Do you sense that you have known a loved one before this lifetime? What about before the creation of this Universe? Or, as Euripides call it, before the silence of nature broke or before the Big Bang. According to some theories, the Universe was created with the Big Bang. Therefore “silence of nature broke” is a synonym for the Big Bang event. To be good listeners and hear what others are trying to communicate, we need to stay silent to listen and feel - not only to words but also to the emotions behind the words. To be great at the art of conversation, we need to allow pauses of silence. We also need to know when is best just to stay silent. For example, how many times someone just need you to listen with empathy and does not desire your advise or opinion? 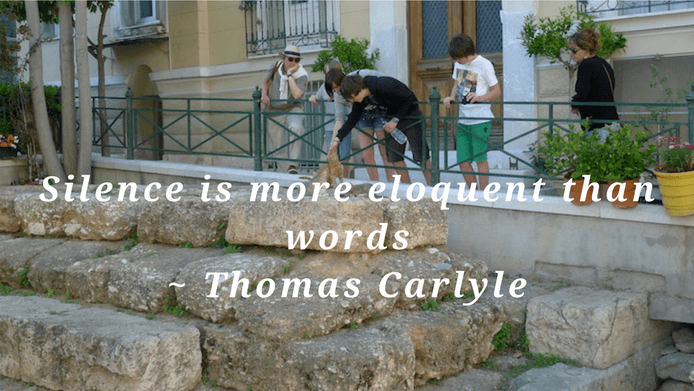 This silence quote by T. Carlyle seems paradoxical. We usually associate eloquence with famous speakers. Then, how can the absence of words be eloquent? We are very expressive with our eyes and body language. We are empathic and can feel each other thoughts and emotions in silence. In this silence quote, Khalil Gibran is pointing out that the beauty of a song is brought forward by the contrast of silence. When we spend time in silence and then listen to a song or piece of music, - we enjoy it more than if we have the music on all day long. 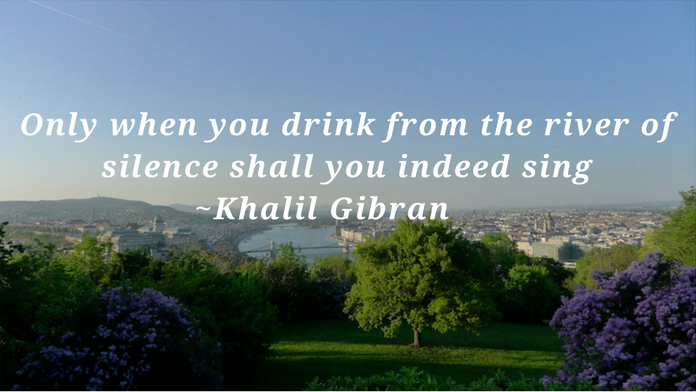 Khalil Gibran, in this silence quote, is advising us to be authentic and avoid saying something half way. He is advising us to stay in silence when we do not intend to communicate a message. Do not speak just for the sake of filling a silence. However, when we have a message, he is advising us to speak up fully and express ourselves bluntly, until we finish what we intend to express. 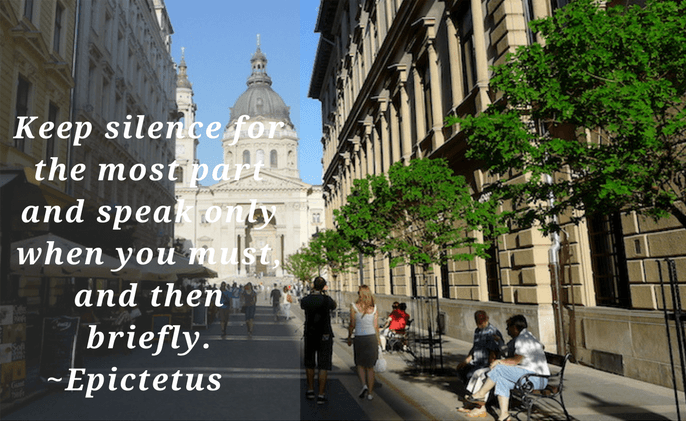 From this silence quote by Epictetus, it is obvious that he was a proponent of being in silence most of the time. He was a proponent of using a concise language. 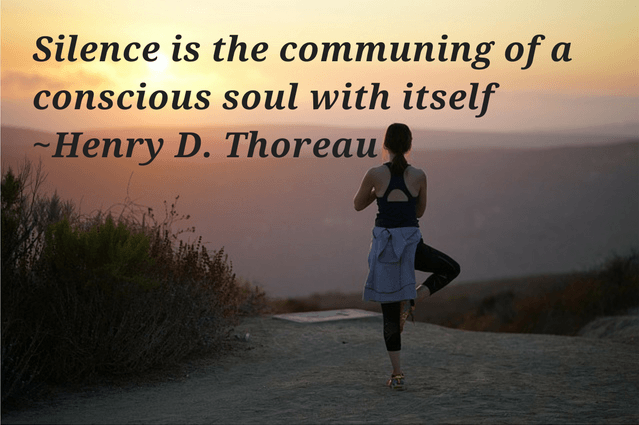 In this silence quote, H. D. Thoreau is defining silence, as the time spent inward consciously communing with our souls. To do this, we need to block time away from external noise and distractions and focus in our inner self. In present times, people are so used to words (spoken or texted). This applies to all relationships, both friends and family. Therefore, if we decide to cut down on words and practice silence, others might misunderstand our silence. Or, if family member or friend cut down on words, we might misunderstand their silence. Next time, let us not take it personally and take the opportunity to practice communication without words. What if we could feel briefly what they are feeling and have more empathy and understanding? What if we could communicate telepathically? People who are inclined to silence can be misunderstood as lacking confidence. 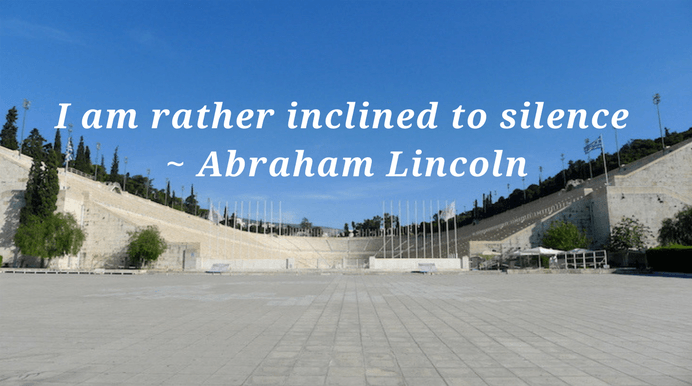 This silence quote by Abraham Lincoln is inspirational for those of us that are inclined to silence and therefore might doubt our confidence. 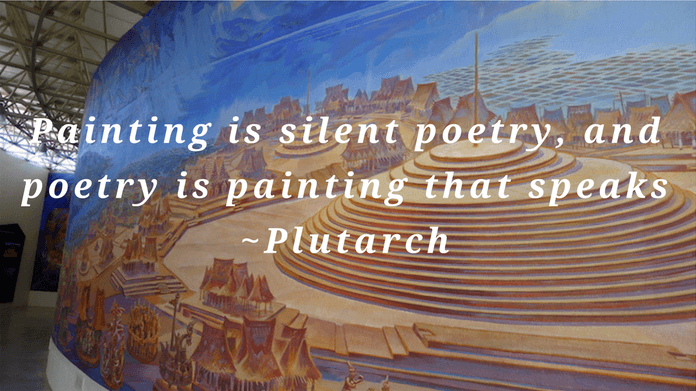 Plutarch in this silence quote is taking about the interchangeable nature of our senses. He is taking about hearing a painting and seeing a poem. It is a paradoxical concept. However, this is the way that people who have lost or were born without hearing or eyesight, they compensate with other senses. 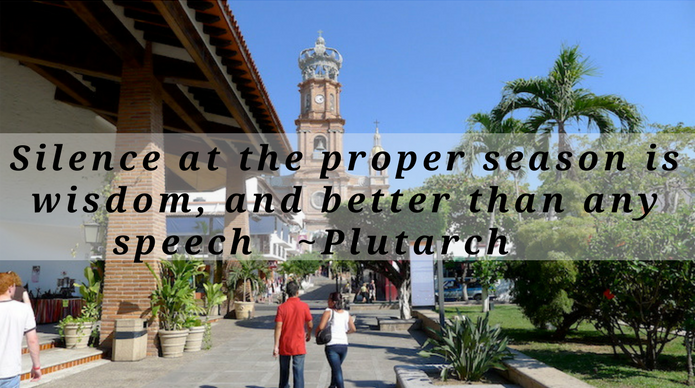 Plutarch is simply saying in this silence quote, that there are times that being in silence is wiser than words. For example, if we are trying to persuade a friend to stop an addiction, we need to recognize if our words are helping or not. In this example, even with our best intentions, our words might trigger more resistance in our friend. In this case silence is better than speech. Marcus Aurelius is saying that to find peace we need to go within and communion with our souls. This is what meditation is about. Beyond words and our mind chatter there is the silent peacefulness of our souls. Silent is golden because it allows space and time to connect with your inner authentic self. The kingdom of heaven is within. Therefore, silence is golden because it facilitates access to the treasures that are within you. To access the gift of your intuition, silence and stillness is needed. Therefore, silence is golden because your intuitive guidance is golden. States of peace, calmness, and stillness are easier to access in silence. 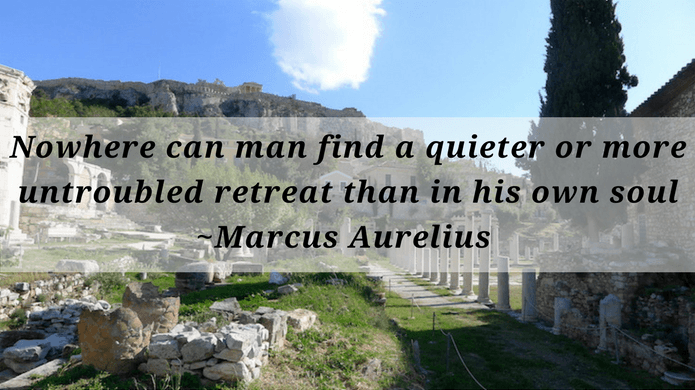 You might have heard of silent retreats where you spend several days without speaking to others and away from electronics. 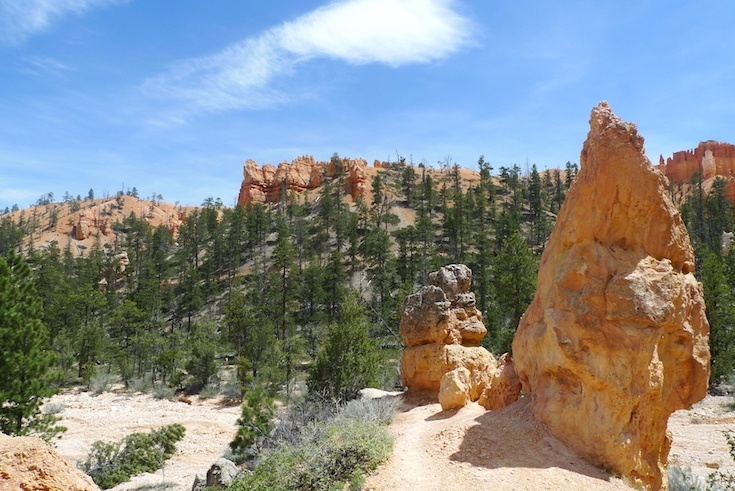 Attend a silent retreat and experience why silence is golden. In the present state of conscious evolution, our society relies mostly on written and spoken words for communication. We have not learned to feel and understand each other frequencies. Therefore, language and words are very important in our relationships. This is because clear and authentic communication and sharing is very important. Ideally in our relationships, we are comfortable and combine both words and silence. Ideally, we have the discernment of when it is wise to use words and when silence is preferable.